In addition to Panda Antivirus Pro 2010, Panda has also released new version for it’s another security application – Panda Internet Security 2010. Panda Internet Security 2010 is a complete security solution for businesses and home used, which protects against Internet-borne worms, hacker attacks, viruses, spyware, online fraud and also prevents data theft (login details, credit card numbers, etc.). The new Panda Internet Security 2010 has added Panda USB Vaccine technology to protects USB drives from infection and integrates Anti-Banking Trojan Engine that can detects the most dangerous identity theft malware used by cybercriminals to steal banking credentials. Apart from that, its also comes with parental control that lets children browse the Internet safely by blocking access to violent, adult, or racist content, as well as other inappropriate websites. 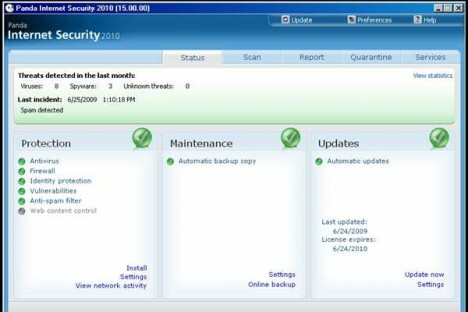 Furthermore, the new version has improved anti-rootkit technology that can detects and removes silently-installed rootkits used by malware or hackers and also be able to make automated backup copies of the most important documents and optimize the performance of users computer. The new Panda Internet Security 2010 (aff) is currently available through Panda Security Store (aff) from starting price of $59.95. User who want to try out Panda Internet Security can directly download the Panda Internet Security 2010 free trial setup installer by using links below. The free trial includes 1 month’s free services to tech support via forum, e-mail and Internet, SOS Virus, updates against new viruses, and antivirus updates.